1ERXE VE] W[MQW SZIV E TEXGL VIIJ EQSRK ]IPPS[ W[IITIVW ERH SXLIV WGLSSPMRK ½WL ,ERMJEVY &E] IRXVERGI ,ERMJEVY 0EKSSR &EE %XSPP 1EPHMZIW near-panicked passengers, he moved to the stern and called out to the other boats, which then took up the shrill alarm. In a matter of moments, W[MQQIVW JVSQ ½ZI FSEXW [IVI XLVEWLMRK EGVSWW XLI WYVJEGI MR E JVIR^] toward the animal which was still swimming into the lagoon. Beneath the surface, 10 scuba divers were also converging toward the same point as fast as they could propel themselves, belching clouds of exhaust bubbles MRXS XLI [EXIV GSPYQR EW XLI] JYVMSYWP] ½RRIH XS[EVH XLI HEVO WLETI 8LI WPS[ QSZMRK FYX RSX HMQ [MXXIH ½WL UYMGOP] MRJIVVIH XLEX %VQEKIHHSR was approaching, did a rapid about-face, and exited the lagoon. One of the divers managed to return to the boat with his prize—a digital image of the JEMRX SYXPMRI SJ E PEVKI WTSXXIH ½WL NYWX MHIRXM½EFPI XLVSYKL XLI LE^I SJ XLI water separating it from the diver. Hanifaru Lagoon, in Baa Atoll, in the northern Maldives Archipelago of the Indian Ocean, has developed a reputation as a whale shark “hotspot.” -RHIIH EW QER] EW WIZIR I\IQTPEVW SJ XLI PEVKIWX ½WL MR XLI SGIER LEZI been seen there at one time, slurping a dense stew of plankton that collects in the small hook-shaped bay on the south side of the lagoon when the wind and tides are just right. 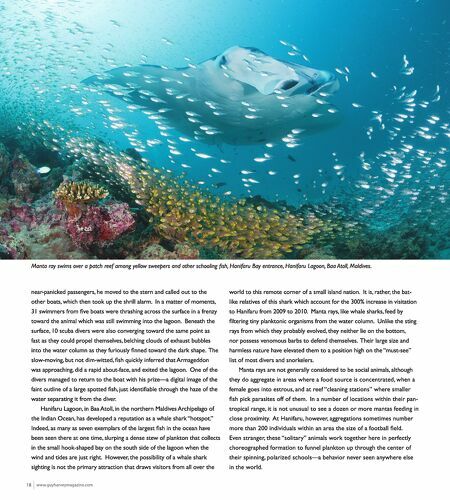 However, the possibility of a whale shark sighting is not the primary attraction that draws visitors from all over the 18 www.guyharveymagazine.com world to this remote corner of a small island nation. It is, rather, the bat- like relatives of this shark which account for the 300% increase in visitation to Hanifaru from 2009 to 2010. Manta rays, like whale sharks, feed by ½PXIVMRK XMR] TPEROXSRMG SVKERMWQW JVSQ XLI [EXIV GSPYQR 9RPMOI XLI WXMRK rays from which they probably evolved, they neither lie on the bottom, nor possess venomous barbs to defend themselves. Their large size and harmless nature have elevated them to a position high on the “must-see” list of most divers and snorkelers. 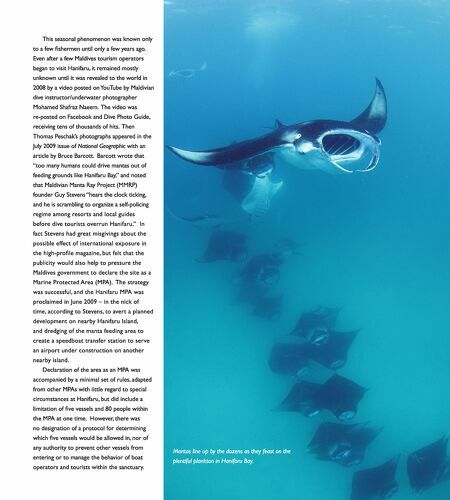 Manta rays are not generally considered to be social animals, although they do aggregate in areas where a food source is concentrated, when a female goes into estrous, and at reef “cleaning stations” where smaller ½WL TMGO TEVEWMXIW SJJ SJ XLIQ -R E RYQFIV SJ PSGEXMSRW [MXLMR XLIMV TER tropical range, it is not unusual to see a dozen or more mantas feeding in close proximity. At Hanifaru, however, aggregations sometimes number QSVI XLER MRHMZMHYEPW [MXLMR ER EVIE XLI WM^I SJ E JSSXFEPP ½IPH Even stranger, these “solitary” animals work together here in perfectly choreographed formation to funnel plankton up through the center of their spinning, polarized schools—a behavior never seen anywhere else in the world.